A leader for the organization Indivisible Project, a progressive group formed as a reaction to the election of Donald Trump, said on Tuesday night that Indivisible will fight to defeat Trump's Supreme Court Justice nominee Brett Kavanaugh by forcing Republican Sens. Lisa Murkowski (Alaska) and Susan Collins (Maine) to be the deciding votes against him. 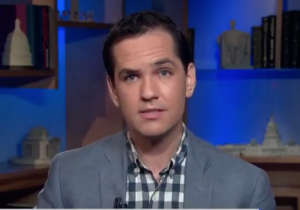 "They don't want to be the deciding vote on this, we're going to force them to be the deciding vote on this," Ezra Levin said during an appearance on on MSNBC's "The Last Word." The Indivisible co-founder joined host Lawrence O'Donnell to discuss his organization's strategy in defeating Kavanaugh, citing his organization's success last year in opposing Republican efforts to repeal the Affordable Care Act, or Obamacare. "Do you have a strategy to deal specifically with Senator Collins and Senator Murkowski?" O'Donnell asked. Levin said Indivisible's strategy last fall with Obamacare was successful because they were able to unify Democrats and peal off a couple Republicans. He explained he hopes to use the same strategy this summer to pit Murkowski and Collins against Kavanaugh and Republicans supporting him. He went on to say their goal is to get every Democrat to oppose Kavanaugh in order to eliminate political cover for Collins and Murkowski, forcing them to be the deciding votes against his nomination. "Does this mean that when Lisa Murkowski and Susan Collins are making public appearances in Alaska and Maine, they will be hearing from opponents of this nomination?" O'Donnell asked. Levin said they are already hearing from Indivisible groups, the members of which are showing up at the senators' campaign offices. "This has already begun. Folks are energized. When we launched this campaign just about a week ago in order to fight this nominee, our website crashed with the number of people signing up in order to oppose this nominee," Levin said. "We know that this is possible if people stand up and that means on focusing on your two senators, getting them on the record. It doesn't matter if you're in a red state or a blue state or a purple state. We need leaders out there to fight this nominee and win." While Indivisible touts itself as a grassroots organization, it has received funding from Linkedin co-founder Reid Hoffman, who has donated tens of thousands of dollars to Democratic candidates and recently donated $1 million in May to the Democratic super PAC, Forward Majority Action. It has also received funding from foundations or coalitions tied to Democracy Alliance donors. Sarah Dohl, an official with Indivisble, said last year that the group would "gladly" accept donations from George Soros, according to the New York Times.